Opera has always been the Avis or RC Cola of Web browsers--just behind the leading two, even as the identity of the leaders shifted over time. Opera 12, reviewed some time ago, was the last of one development path. Since then, the rendering engine has shifted (to the Chromium platform) and so has the design direction. A series of rapid-fire releases began with Opera 15, and Opera 18 is the latest release build, with Opera 19 in the testing stage. Opera 18 takes an extremely minimalist approach to browser design, perhaps because there is now a focus on phone, tablet, and desktop interoperability. It's so minimalist, bookmarks are no longer considered an essential part of the browser experience. By delving into some obscure settings, one can activate a "quick access bar," and then jump through more hoops to simulate the typical bookmark menu. Sort of. In place of bookmarks, the developers encourage you to use their "Start Page" and "Stash" features, the latter letting you store webpages for later on a "Stash" page. Because everything is page-based, you have to switch from what you're looking at to go to the Start Page or the Stash. Want to browse your history? That also takes up a page. This is a depressing change. Opera 12 made great use of the mostly-wasted horizontal space on desktop monitors, with sidebar tabs (a must for me, since I will not use a desktop browser without a tab sidebar), and a multi-pane second sidebar that held bookmarks, history, downloads, a notepad, and more. Opera 18 has none of this, just a vast blank space 1920 pixels wide on my screen. Being able to see only one thing at once, in 2013, is ridiculous. On a small tablet or phone? Sure, that's understandable. On a desktop? No. Not acceptable, Opera. 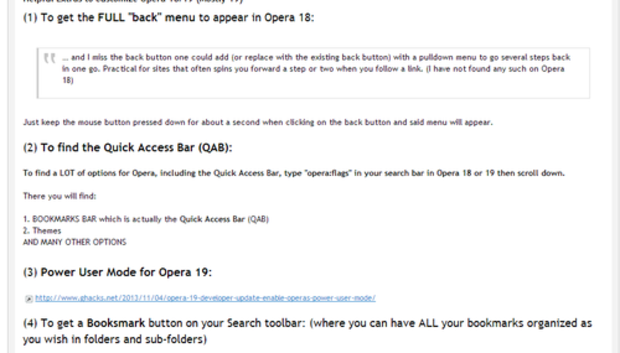 Apparently the folks at Opera understand not everyone is on-board with the 1995 flashback as they are keeping Opera 12 actively maintained. Additional features in Opera 18 include integrating the search bar and the address bar into a single text field, which is fairly neutral to me. You can add multiple search engines and use them by prefixing your search with a code character. Themes--basically, just wallpaper--are also available. Tabs can be dragged from one open window to another. A "Discover" feature shows news and other articles in various categories, sort of a built-in StumbleUpon, but it doesn't have a learning feature to tune what's presented to you, beyond a basic category filter. Otherwise... it renders pages. So does every browser. I judge a browser on what it does besides rendering pages, and in the case of Opera 18, that's not much. I encountered very few bugs, and the few I did find either could not be replicated or were clearly related to third-party plug-ins. Speed is fine. It's not as sluggish as Explorer (what is, other than an Etch-a-Sketch? ), but it's not noticeably faster than its peers. Obviously, with multiple releases in this new direction (15 to 18), there is a target audience for the stripped-down feature set. The forums are full of people who are extremely...enthusiastic...in their support for the new design and eager to respond to critics with the grace, tolerance, and understanding that the Internet has been known for as long as I've been on it, which is longer than I care to admit in public. If your browsing situation is one where you need every pixel for display, you might find the new Opera to your tastes.